Why is Integrity still visible in both places? Why is ThingWorx not visible in the Widget? 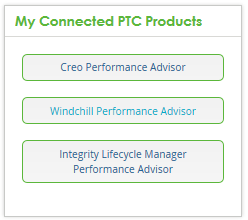 Finally, why does the initial PTC Performance Advisor home page say, "Welcome undefined" in the top right corner? We need to add a tooltip to explain this setting, and also improve the experience when customers activate or de-activate one or more of them. The "Product Diagnostics & Analytics" setting is the setting which grant access to the Performance Advisor dashboards, and is also used to determine whether (and which) proactive widget is shown on support.ptc.com, also whether the Proactive Zone and Proactive Notifications and Alerts are sent for your account. This is primarily for Administrators to "gate" access to the dashboards for members of their company. In terms of what needs to be improved, the "My Connected Products" portlet and PA home page should only show links to the Dashboards you've selected. "My connected products will be reworked as part of our upcoming migration to a new web platform during the July-September timeframe. Regarding the PA home page, would you be able to add an idea here for our PA team in Product Management ? Lastly, the "undefined" message is likely a further issue with the recent new deployment of the PA. I'll make the development team aware, and request that they address this as part of the current set of fixes being applied.